After making waves with Mujhse Fraandship Karoge, Yash Raj Films' subsidary Y-Films has launched a new film called Mere Dad Ki Maruti. 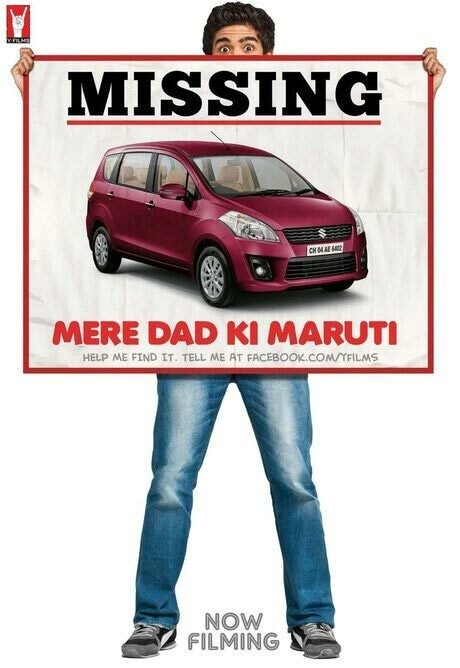 Mere Dad Ki Maruti tells the story of a boy, who sneaks his dad's new car out to impress the college hotties and how all hell breaks loose when he loses it! The comedy is set against a loud Punjabi wedding in Chandigarh. Directed by debutant Ashima Chibber, the film stars Saqib Saleem who made his debut in Y-Films' Mujhse Fraaandship Karoge. Coming after Vidhu Vinod Chopra's Ferrari Ki Sawari, it seems Bollywood is waking up to cars! Director Kunal Kohli shared the making of the song Humse Pyaar Kar Le Tu from his upcoming film Teri Meri Kahaani, starring Shahid Kapoor and Priyanka Chopra. The film will release on June 22. Meanwhile Madhuri Dixit, who celebrated her birthday yesterday, thanked everyone for wishes. 'Hi guys! Thank you for all the wonderful birthday wishes and for making this day so special!! Here is to making every day great!! Love M,' she wrote. Pooja Bedi is enjoying her vacation with her children and Akashdeep Saigal. 'With @iamsky_walker and my kids at the grove in los angeles!! Lovely sunny day:) amazing mall!' she tweeted with a picture. Preity Zinta was amused to see recycling bins at the Delhi airport and couldn't help sharing a picture. 'Nice to see recycling bins at Delhi airport ! Must say I was pleasantly surprised :-)' she tweeted with a picture. Just How Have Star Kids Fared At The Box Office?